The Christmas period is typically a time for gingerbread, Yule cakes, chocolate and all-around delicious desserts and treats. Unsurprisingly, this also means a great deal of sugar. As much as we love the taste, the amount of sugar that abounds on the holidays can give pause to even the most ardent sweet tooth. Fortunately, there are steps you can take to minimize the impact of sugar on your holiday baking projects. Numerous natural alternatives exist that can add delicious sweetness without all of the empty calories of white sugar. For comparison, a single cup of white sugar contains around 774 calories and 200 grams of sugars. When the blue agave plant—the same spiky wonder tequila comes from—reaches around seven to 10-years-old, the leaves can be removed and sap extracted from the core. This sap is then filtered and heated to produce tasty syrup that can serve as an effective sugar substitute. Agave is of particular interest to diabetics since it is lower on the glycemic index, meaning it doesn’t impact blood sugar as strongly. Agave nectar (or agave syrup, it goes by both terms) is substituted for sugar at a rate of 2/3 cups of agave for every cup of sugar in a recipe. This results in 449 calories, 100.3 grams of sugar per substitution. Agave is syrup, not a powder, so you will need to reduce other liquids involved in the recipe by around a 1/4 of a cup to compensate, and you will of course need to mix it in with the wet rather than the dry ingredients. Agave also browns faster than sugar so you will want to lower your oven by around 25 degrees when baking with it. Honey is the result of evaporated flower nectar that has been brought back to a beehive as a way to feed the colony. Honey may seem like an odd inclusion here, since an effective substitute (3/4 of a cup for every cup of sugar) contains almost the same caloric and sugar content as the sugar you’re substituting it for. 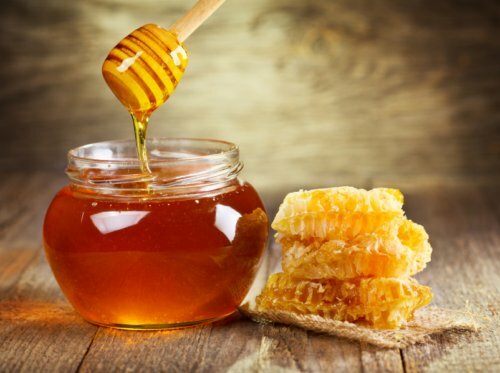 The reason you may want to consider honey is because it is also a good source of potassium, vitamin B, and vitamin C. This means that honey may not have much less caloric impact but it does have greater nutritional influence. When baking with honey, you will need to reduce the other liquids in the recipe by 1/5 and lower the baking temperature by 25 degrees to prevent browning. The stevia plant has been consumed for its sweetness in South America for several centuries. It is known for being up to 200 times sweeter than an equivalent amount of sugar in its purest form and having zero calorie content. This is because the glucose in stevia is bound up in a different type of molecule that your tongue tastes as sweet but your body doesn’t process as sugar. You can learn more about stevia here. When baking, substitute a 1/2 cup of stevia for every cup of sugar. Stevia does not react to heat in the same way as sugar so you will need to use a smaller pan and lower baking temperature—about 25% smaller for each. Also, stevia tends to result in a drier final product so you will want to compensate by adding an extra egg white, a bit more baking powder, or some fruit puree. Stevia is also known for having a bitter aftertaste so be careful about substituting it for large quantities of sugar. These giant raisin look-alikes are surprisingly good for adding sweetness to recipes and are perfect for smaller dessert bars, brownies, or cookies. A 2/3 cup of dates is an effective substitute for one cup of sugar, resulting in a little over 266 calories and around 64 grams of sugar. Additionally, they are a good source of fiber, copper, potassium, and vitamin B6. When cooking with dates, you will want to puree them by pouring on a 1/4 of a cup of hot water per 1/2 cup of dates, let it sit until softened, and then blend. The result should be a paste with a consistency similar to hummus. It’s important to remember that dates have a strong flavor and should only be used as a substitute in a recipe with a compatible flavor profile, like carrot cake. This syrupy byproduct of sugar cane processing is great for gingerbread cookies. It takes 1 and 1/3 cups of molasses to replace a single cup of sugar. It’s important to note that an equivalent amount of molasses has a whopping 1,002 calories and 259 grams of sugar. It does, however, offer an entire day’s worth of calcium potassium, and iron while also adding in vitamin B and copper for antioxidant action. Molasses is more acidic than sugar so you need to adjust for its use in recipes. A half-teaspoon of baking soda (only if not already present in the recipe) will do the trick, or you can lower the other liquids used by a 1/3 of a cup. This Canadian favorite is made by boiling, evaporating, and filtering the sap of the maple tree. It can be swapped in at a rate of 3/4 cups of syrup for every cup of sugar. You will also get to enjoy calcium, magnesium, iron, and zinc for a better immune system and omega-6 fatty acids to boot. It’s important to make sure when you are buying maple syrup that you are getting the real stuff and not just flavored “table syrup”. To make up for the liquid content of the syrup, you should reduce other liquids in the recipe by around three tablespoons each. Baked goods will have a more brownish tint due to the syrup’s inclusion and also brown faster. Lowering oven temperature by 25 degrees will help compensate for this. I hope you enjoy using these substitutes when baking more nutritious Christmas treats. Remember, snack responsibly! Kerns, M., “The Serving Size for Medjool Dates,” SF Gate web site; http://healthyeating.sfgate.com/serving-size-medjool-dates-9624.html, last accessed December 17, 2015. Schwecherl, L., “30 Sugar Substitutes for Any and Every Possible Situation,” Greatist web site, February 11, 2014; http://greatist.com/health/30-sugar-substitutes-any-and-every-possible-situation. Sugar, J., “Are Sugar Substitutes Really Healthier Than White Sugar?” Popsugar web site, August 27, 2015; http://www.popsugar.com/fitness/Best-Sugar-Alternatives-Baking-30861504.